Africa and Europe met at the Great Hall last night. Bassist, composer and Wits lecturer, Carlo Mombelli reunited with his European touring band, the Stories Ensemble, joined by Capetonian pianist Kyle Shepherd. They played music from Mombelli’s latest album, Stories. Groove met classical and traditional at the Wits Great Hall last night. 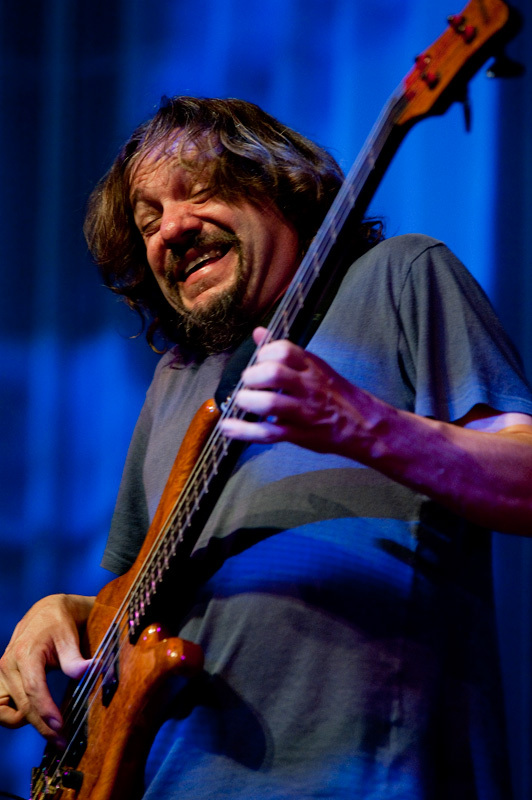 Composer, bassist and Wits music lecturer Carlo Mombelli and his band, the Stories Ensemble, took jazz music and stretched it. They played music that not only entertained, but pulled at the heartstrings – places indescribable by words. Mombelli brought his European band, the Stories Ensemble, for a South African tour that had them performing at the Cape Town International Jazz Festival, at the University of KwaZulu Natal, in Maputo, Mozambique and ending off at the Wits Great Hall. They mainly performed music from Mombelli’s latest album, Stories (Instinct Africaine), recorded in Switzerland. Born in Pretoria, Mombelli taught himself how to play the bass at age 16, and later went on to start his own band called Abstractions in 1985. He has performed with South African jazz greats like Marcus Wyatt, Zim Ngqawana and Miriam Makeba. He has, and continues to, perform all over the world. Last night, the bassist was joined by Zulu ‘traditional’ vocalist Mbuso Khoza, whose clean yet strong and passionate voice effortlessly blended in with the ensemble. Adrian Mears’ warm trombone transitioned from powerful to delicate melodies in an instant. Drummer Dejan Terzic created a full, rounded powerful sound. Cape Town pianist Kyle Shepherd, who was not part of Mombelli’s original recording in Switzerland, merged his Cape jazz style with the eclectic sound of the band. His playing was intimate, compelling and strong, as usual. The classical element was brought by cellist Daniel Pezzotti, bringing elegance and originality to the group. Mombelli began the set with a composition titled Requiem, originally performed with his band The Prisoners of Strange in 1996. The Hunter had the crowd grooving to its infectious bouncy melody. Shepherd took it to Cape Town, Khoza brought in a dynamic traditional component, resulting in a trance-like element to the music. A poetic tribute to Mombelli’s first piano teacher titled, For Mrs Loveday, then followed. Experimentation, creativity and improvisation. All elements piercing through the music. On stage, Mombelli was tiny and short, and his bass guitars seemed almost too big for him. But, he connected with his band members like a choir master would to a 60 voice choir. Making eye contact, hand signals and head nods that indicated when to start, stop or pause. A seamless form of communication. At times, Mombelli played with his back turned to the audience. Not as an act of alienation, but to rather unite – the audience, the band members, and those only among us in spirit. “I love teaching, and I am very anti the ‘jazz police’” Mombelli told The Cape Argus last year. This shows in the Ensemble’s style of playing – going beyond rigid boundaries. Their music moves. It drives itself, creating new possibilities for the art of making music. Carlo Mombelli and the Stories Ensemble delivered a solid performance, but what else can we expect from some of the world’s most creative and sought after musicians?